Symbolizing timeless joy, hummingbirds inspire Alon Diller to design these earrings. They are crafted by hand with silver featuring a polished finish with oxidized contrasts to mark the feathers. 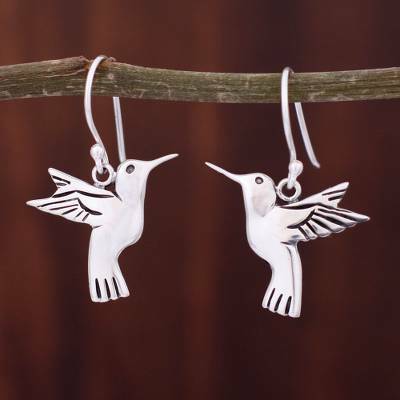 You can find sterling silver dangle earrings 'Hummingbird Secrets' by Alon Diller in jewelry categories such as Animal Themed Earrings, Taxco Silver Earrings, No Stone Earrings, Silver Earrings, Fine Silver Earrings and Dangle Earrings. Enjoy exploring these sections for other Novica treasures. This looks stunning with the Turquoise pendant necklace, 'Taxco at Dusk'! The "Hummingbird Secrets" earrings are absolutely beautiful! If you're a nature lover, you will adore this item. The earrings are big enough to be noticed (neither too small nor too large) and very stylish. I'm wearing them now! These earrings are absolutely beautiful. I bought them as a Christmas gift for my granddaughter. She is going to love them. Thank you Alon! "They say 'there's nothing new under the sun,' but there are always thousands of ways to create a piece to renew it." "For as long as I can remember, I have always been keen on handicrafts, especially jewelry, which I started making when I was a teen. I was born in Israel and traveled through Africa and America, always challenging myself to make different designs with what I found in the different countries I visited, such as wires, seeds, gems, bamboo, ceramic, and bone amongst others. "In 1995 I arrived in Mexico and became enthralled by the quantity, quality and variety of artesanias. I traveled up and down the country until someone told me about Taxco, describing it to me as the 'jewelry capital of the world.' When I came and discovered their art school, I just knew this was the place for me! "I enrolled in Mexico's renowned National University (UNAM) where I learned about design, drawing, art history, lapidating, engraving, photography and of course, jewelry-making. By the time I finished in 1999 I felt I had gained a solid foundation that has allowed me to develop my own style and design. My collections have been well-received throughout Mexico. "As form of expression, through jewelry I am able share what I observe, what I think and what I experience. When I'm designing I search for beauty, aesthetics and elegance. I look for a way to leave my personal mark. "My favorite themes include contrasts, textures, contemporary designs and geometry. I enjoy transforming the old into the new. They say 'there's nothing new under the sun,' but there are always thousands of ways to create a piece to renew it." I bought 'Architectural' because I'm a fan of Mr. Legorreta & I had honestly never seen a cutout ring as beautiful as this. When it arrived, I just adored the brushed silver which looks really high quality, and has gone months without even a single tarnish! I get so many compliments on the subtle, effortless minimalist design all of the time. I really love it, it reminds me of the space age metal detailing on a retro muscle car, such bold chic! Dress up, or jeans and a shirt! Looks great with or without ring guards. I get compliments on this!!! Love it! Awesome ring! I get compliments on this. I can wear certain ring guards with this to change the look, .. or I can just wear the ring like it is! Dress up, or t shirt and jeans!